“Short Sale Specialist Interview” eBook. A $9.97 value. 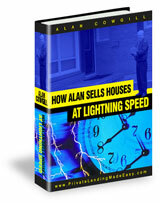 Included are three key forms that Alan uses when he sells houses. These forms are included in the eBook. “How to Sell Houses at Lightning Speed” will take the worry out of getting your houses sold. When you can sell houses at lightning speed you will be in control of the back end of your real estate business and be able to create an amazing cash flow. Why waste another minute? Once you see how Alan’s system for selling houses can help you, your only regret will be that it took you this long to find it. Order now..